Comm Eye Health Vol. 16 No. 46 2003 pp 21 - 24. Published online 01 June 2003. Diabetes mellitus is a metabolic abnormality in which there is a failure to utilise glucose and hence a state of hyperglycaemia can occur. If hyperglycaemia continues uncontrolled over time, it will lead to significant and widespread pathological changes, including involvement of the retina, brain and kidney. Diabetic retinopathy is increasingly becoming a major cause of blindness throughout the world in the age group of 20-60 years.2,3,4 Loss of productivity and quality of life for the patient with diabetic retinopathy will lead to additional socio-economic burdens on the community. The VISION 2020 protocol projects diabetic retinopathy and the glaucomas as the ’emerging’/causes of blindness in developing countries. Epidemiological studies such as the Wisconsin Epidemiological Study on Diabetic Retinopathy,8 the Diabetic Retinopathy Study (DRS),9,10,11 the Early Treatment of Diabetic Retinopathy Study (ETDRS),12,13,14,15,16,17 the Diabetes Control and Complications Trial (DCCT),18 the Diabetic Retinopathy Vitrectomy Study (DRVS), 19,20 and the UK Prospective Diabetic Survey 21 have established the various risk factors and provided guidelines for the management of diabetic retinopathy. Type of Diabetes and its Duration. Tables 1 and 2 show the relationships between the type, duration of diabetes mellitus and retinopathy. Control of Diabetes Mellitus. The Diabetes Control and Complications Trial (DCCT)18 has shown that in Type 1 insulin dependent diabetes mellitus (IDDM), good control of metabolic status will reduce the risk of progression of diabetic retinopathy and delays the onset of retinopathy in patients who do not have retinal changes at the time of presentation. The United Kingdom Prospective Diabetes Study (UKPDS)21 has confirmed that good glycaemic control in Type 2 non-insulin dependent diabetes mellitus is also beneficial and delays the onset of retinopathy. Hypertension. Reports have indicated that high diastolic blood pressure in young individuals8 and higher systolic blood pressures in older individuals21 can worsen the retinopathy. Pregnancy in women can be associated with worsening of the retinopathy. Hyperlipidaemia. Some studies have indicated that high levels of serum cholesterol and/or triglycerides are significant risk factors for retinopathy. However, it is yet to be clearly proved that therapy to reduce serum lipids affects any retinopathy. Cigarette smoking may or may not be an additional risk factor as its effect on cardiovascular disease is well documented. Age. 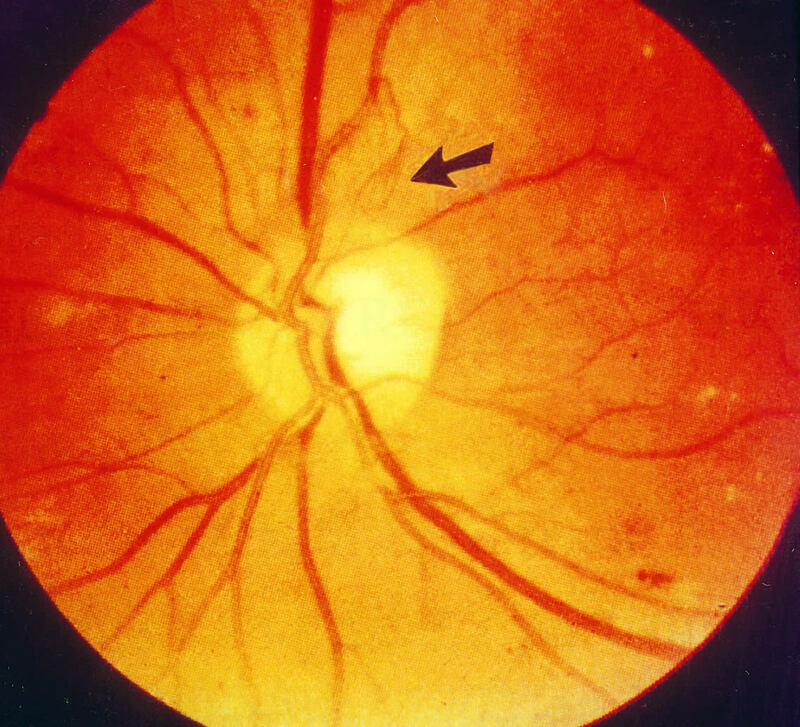 In younger onset diabetes, diabetic retinopathy is uncommon before the age of 13 years. The onset of puberty may influence retinopathy – although the duration of diabetes is a significant factor. In those with older onset diabetes there is an increased frequency of retinopathy in those younger than 50 years. Ethnicity. The variety of study designs make comparisons difficult, but Afro-American blacks do seem to have more retinopathy than whites. The lesions in the retina at this stage are within the retina and include micro-aneurysms, small ‘dot and blot’ haemorrhages, ‘splinter’ haemorrhages, intraretinal microvascular abnormalities (IRMA) and ‘cotton wool’ spots. The presence of these lesions in various degrees determines whether the NPDR is ‘mild’, ‘moderate’, ‘severe’ and ‘very severe’. 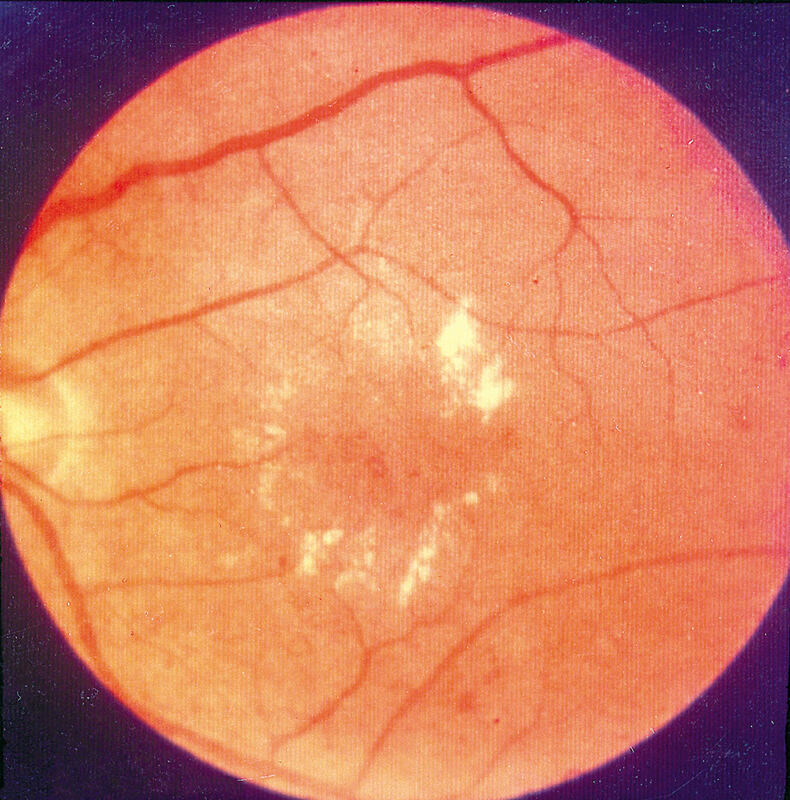 At least one microaneurysm, and also dot, blot or flame-shaped haemorrhages in all four fundus quadrants. Intraretinal microaneurysms and dot and blot haemorrhages of greater severity, in one to three quadrants. Cotton wool spots, venous calibre changes including venous beading, and intraretinal microvascular abnormalities are present but mild. At least one of the following should be present: a) ‘severe’ haemorrhages and microaneurysms in all four quadrants of the fundus, b) venous beading, which is more marked in at least two quadrants, and c) intraretinal microvascular abnormalities, which are more severe in at least one quadrant. Two or more of the criteria for severe non-proliferative diabetic retinopathy, but without any proliferative diabetic retinopathy. Diabetic retinopathy situated in and around the macula is described as diabetic maculopathy, which can result in significant visual impairment. All these background diabetic retinal changes are due to pathology occurring at the microvascular level of the retina, including dilatation of the capillaries, destruction of the capillary walls and closure of the capillaries resulting in hypoxia and micro-infarcts. An area of retinal thickening greater than one optic disc area in size, at least a part of which is within one disc diameter of the centre of the macula. The following photographs show non-proliferative and macular diabetic retinopathy. 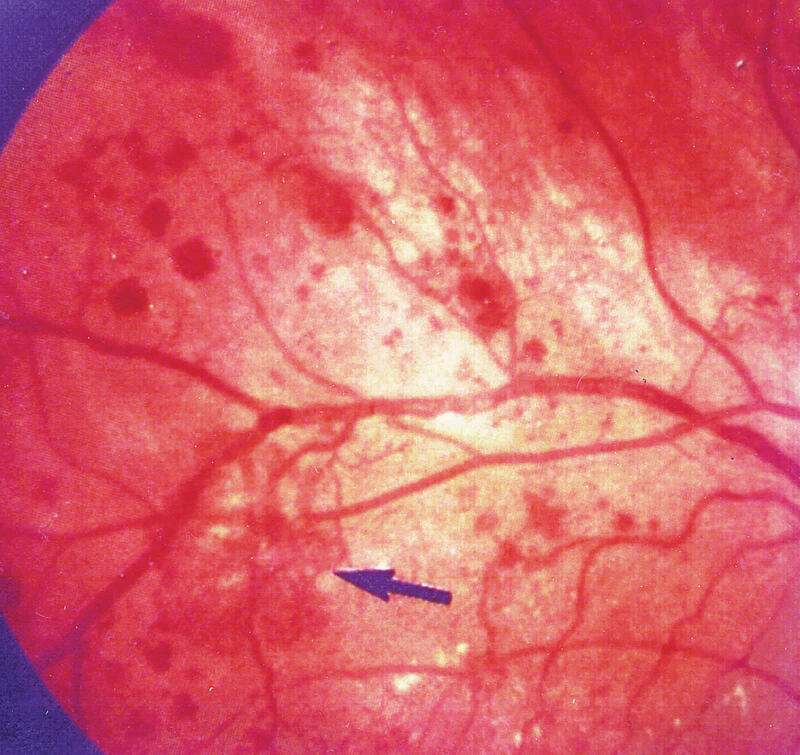 Moderate non-proliferative diabetic retinopathy (Figure 1). Micro-vascular pathology with capillary closure in the retina leads to hypoxia of tissue. The hypoxia leads to release of vaso-proliferative factors which stimulate new blood vessel formation to provide better oxygenation of retinal tissue. These new vessels growing on the retina are called neovascularisation elsewhere (NVE) and those on the optic disc are called neovascularisation of the disc (NVD). These new vessels can bleed and produce haemorrhage into the vitreous. 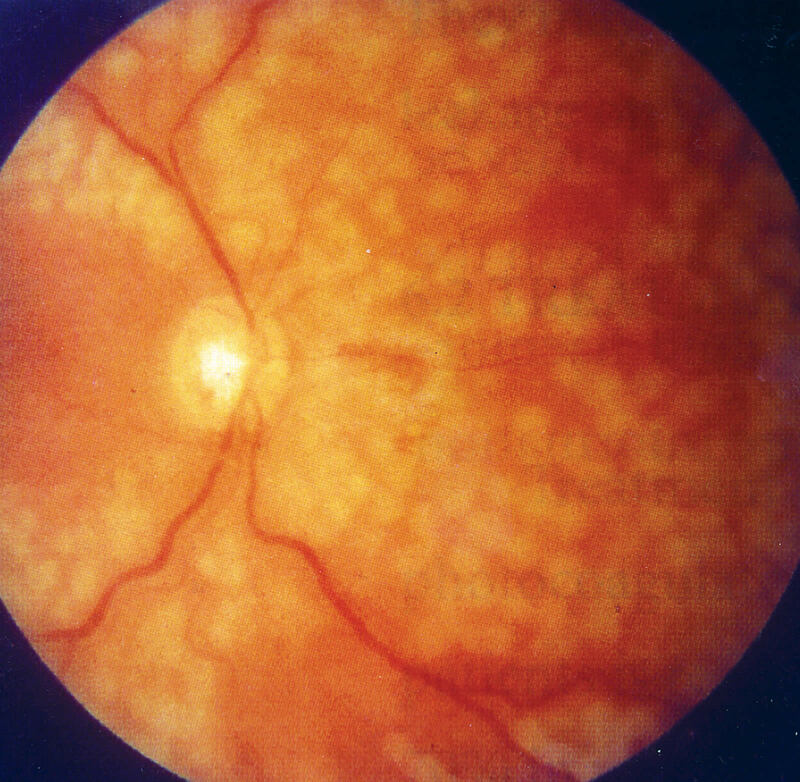 The following photographs show examples of proliferative diabetic retinopathy (PDR). PDR with NVE (Figure 3). PDR with NVD (Figure 4). The unchecked progression of proliferative diabetic retinopathy can lead ultimately to tractional retinal detachment, which may or may not involve the macula. Vitreous haemorrhage may require B-scan ultrasonography to determine if a tractional or rhegmatogenous (retinal break or hole) retinal detachment is present. Neovascularisation of the anterior segment of the eye may cause intractable painful blindness due to neovascular glaucoma. Diabetic retinopathy does not reduce vision in its early stages, when treatment is most effective. Preventing blindness from retinopathy relies on early detection of asymptomatic disease by fundus examination. The fundus may be examined by ophthalmoscopy, using a slit lamp and either a contact lens or a 78D lens, or by retinal photography, which may use conventional film or a digital camera. It has been shown that fundus photography is the most accurate means of screening for retinopathy. The photos allow an ophthalmologist to examine a large number of eyes very quickly. Digital fundus photography is expensive initially, but has very low running costs as it does not require film or developing the pictures. The images are available instantly. The quality of digital photos is not as good as conventional film, however, they are quite adequate for retinopathy screening. In most developing countries there are too few ophthalmologists for every diabetic to be examined annually by an ophthalmologist. If retinal photography is not possible, then the fundus may be examined by the diabetic physician, an optometrist, or an ophthalmic assistant. Screening for diabetic retinopathy is only effective if it achieves high coverage (at least 80% of known diabetics). It is essential that the screening process should be made as convenient as possible for diabetic patients. It should also be free. Examinations more frequently once diabetic retinopathy is diagnosed. Examination more frequently once diabetic retinopathy diagnosed. Diabetics are at significantly increased risk of cataract. All diabetics should have an annual measurement of visual acuity, and those with vision of less than 6/18 in either eye should have a full eye examination, as they may have cataract, refractive error, or glaucoma. As previously mentioned, good glycaemic control significantly reduces the risk of diabetic retinopathy developing and subsequently progressing. The importance of good control should be emphasised. The advent of laser photocoagulation of the retina has dramatically changed the management of diabetic retinopathy. The photocoagulation of non-proliferative diabetic retinopathy with clinically significant macular oedema is called macular photocoagulation, and widespread photocoagulation for proliferative diabetic retinopathy is called pan-retinal photocoagulation. Photocoagulation for diffuse leakage around the macula may be applied in a ‘grid’ fashion to prevent leakage – grid macular photocoagulation. Diffuse or focal leakage can be identified by fundus fluorescein angiography (FFA). FFA is done with black and white retinal photography using the contrast dye, sodium fluorescein, injected into the blood. Avascular areas within the macular area. Photocoagulating the posterior 45°- 60° of the retina, away from the vascular arcades of the macula, with graded burns – to reduce the oxygen demand of the hypoxic retina in diabetic retinopathy – converts the hypoxic zones of the retina into anoxic zones, thereby reducing the release of vaso-proliferative factors (Figure 5). PRPC, therefore, prevents new vessels appearing and can result in the regression of already existing new vessels on the retina or optic disc. New vessels of the iris. Patients with diabetic retinopathy, whether treated or untreated, need periodic follow-up. Patients with diabetic maculopathy should be reviewed 3 to 4 months after treatment to check if the macular oedema has subsided. Patients who receive PRPC should be reviewed in 3 months to check for the regression or closure of new vessels and for the presence of any new vessels. Non-resolving vitreous haemorrhages and tractional retinal detachment, due to fibro-vascular proliferation involving the macular region, require surgical procedures such as vitrectomy, pealing of epi-retinal membranes, endo-laser photocoagulation during surgery and vitreous replacement with silicone oil or perfluorocarbons. Vitrectomy is indicated for vitreous haemorrhage – performed early for insulin dependent diabetics and after six months in non-insulin dependent diabetics if the haemorrhage does not clear. Prevention of blindness due to diabetic retinopathy requires information on the prevalence of diabetic retinopathy in the general population, identifying the high risk groups amongst diabetics, using cost effective screening methods such as ophthalmoscopy or fundus photography. Treatment facility centres require photocoagulators. Continuing medical education for diabetic care physicians, training ophthalmologists in photocoagulation and health education amongst diabetic patients should be established. It should be kept in mind that diabetic patients in certain populations may have visual impairment or blindness due to other causes, such as refractive error or cataract. The authors are very grateful to Ian Murdoch FRCS FRCOphth and David Yorston FRCS FRCOphth who kindly reviewed this article. Our particular thanks to Philip Hykin FRCS FRCOphth who has written previously for this Journal and whose articles were a source of both guidance and content for this article. Hykin P. Diabetic Retinopathy: Clinical Features and Management. J Comm Eye Health 1996; 9: 58-62. Hykin P. Diabetic Retinopathy: Clinical Features and Management. In: Community Eye Health: Selected and Updated Articles. Ed. McGavin DDM, International Centre for Eye Health, London: In press. 1 Dwivedi RN, Krishna G. Epidemiology of Diabetes in India; Indian Journal of Community Medicine 1999; XXIV: 40-44. 2 Thylefors B, Negrel A D, Pararajasegaram R, Dadzie K Y. Global data on blindness. Bull World Health Organ 1995; 73: 115-121. 3 Global initiative for the elimination of avoidable blindness. An informal consultation. World Health Organization, Geneva, 1997. WHO/PBL/97.61. 4 NPCB – Government of India. Vision 2020: The Right to Sight. Plan of Action, 2001, page No.7, 5.2.1.1. 5 Dandona L, Dandona R, Naduvilath T J, McCarty C A, Rao G N. Population based assessment of diabetic retinopathy in an urban population in southern India. Br J Ophthalmol 1999; 83: 937-940. 6 Narendran V, John R K, Raghuram A, Ravindran R D, Nirmalan P K, Thulasiraj R D. Diabetic retinopathy among self reported diabetics in southern India: a population based assessment. Br J Ophthalmol 2002; 86: 1014-1018. 7 Yorston D, Farid N. Causes of visual impairment in diabetics in Pakistan. Personal communication, 2003. 8 Klein R, Klein B E K, Moss S E, Davis M D, DeMets D L. The Wisconsin epidemiologic study of diabetic retinopathy II. Prevalence and risk of diabetic retinopathy when age at diagnosis is less than thirty years. Arch Ophthalmol 1984; 102: 520-526. 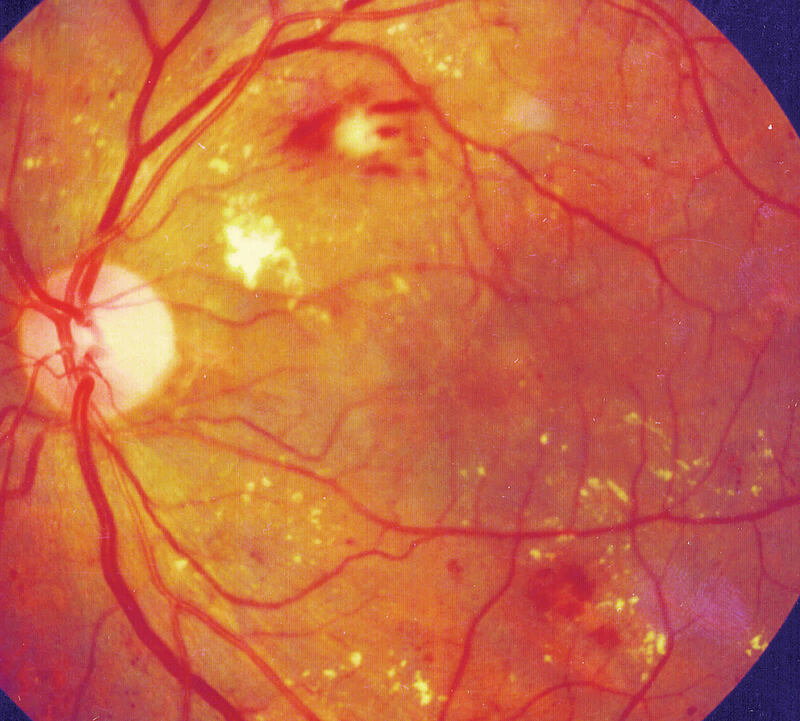 9 Four risk factors for severe visual loss in diabetic retinopathy. The third report from the Diabetic Retinopathy Study. The Diabetic Retinopathy Research Group. Arch Ophthalmol 1979; 97: 654-655. 10 Diabetic Retinopathy Study Report No.7: A modification of the Airlie House classification of diabetic retinopathy. Invest Ophthalmol Vis Sci 1981; 21: 210-226. 11 Photocoagulation treatment of proliferative diabetic retinopathy. Clinical application of Diabetic Retinopathy Study (DRS) findings, DRS Report Number 8. The Diabetic Retinopathy Study Research Group. Ophthalmology 1981; 88: 583-600. 12 Early Treatment of Diabetic Retinopathy Study Report No.1: Photocoagulation for diabetic macular edema. Arch Ophthalmol 1985; 103: 796-806. 13 Treatment techniques and clinical guidelines for photocoagulation for diabetic macular edema. Early Treatment of Diabetic Retinopathy Study Report Number 2. Early Diabetic Study Research Group. Ophthalmology 1987; 94: 761-774. 14 Techniques for scatter and local photocoagulation treatment of diabetic retinopathy: Early Treatment of Diabetic Retinopathy Study Report No.3. Int Ophthalmol Clin 1987; 27: 254-264. 15 Photocoagulation for diabetic macular edema: Early Treatment of Diabetic Retinopathy Study Report No.4. Int Ophthalmol Clin 1987; 27: 265-272. 16 Early photocoagulation for diabetic retinopathy. ETDRS report number 9. Early Treatment of Diabetic Retinopathy Study Research Group. Ophthalmology 1991; 98 (5 Suppl): 766-785. 17 Grading diabetic retinopathy from stereoscopic color fundus photographs – an extension of the modified Airlie House classification. ETDRS report number 10. Early Treatment Diabetic Retinopathy Study Research Group. Ophthalmology 1991; 98 (5 Suppl): 786-806. 18 The effect of intensive treatment of diabetes on the development and progression of long-term complications in insulin-dependent diabetes mellitus. The Diabetes Control and Complications Trial Research Group. New Engl J Med 1993; 329: 977-986. 19 Early vitrectomy for severe proliferative diabetic retinopathy in eyes with useful vision. Clinical application of results of a randomized trial. Diabetic Retinopathy Vitrectomy Study Report 4. The Diabetic Retinopathy Vitrectomy Study Research Group. Ophthalmology 1988; 95: 1331-1334. 20 Early vitrectomy for severe vitreous hemorrhage in diabetic retinopathy. Four-year results of a randomized trial. Diabetic Retinopathy Vitrectomy Study Report 5: Arch Ophthalmol 1990: 108: 958-964. 21 Kohner E M, Stratton I M, Aldington S J. Prevalence of Diabetic Retinopathy at Diagnosis of Non-Insulin Dependent Diabetes in the United Kingdom Prospective Diabetes Study. Invest Ophthalmol Vis Sci 1993; 34: 713 (Abstract).